Should we not look beyond mere “price” and protect ongoing “value?” Full story here. Goats graze on a community pasture. Courtesy of Trevor Herriot's Grass Notes. 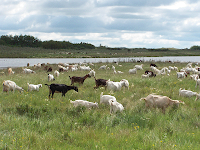 Privatizing the pastures - another blunder by the Harperites?